2049 Spinner | Flickr - Photo Sharing! I absolutely fell in love with the new spinner design from Blade Runner 2049. I immediately started building my own version, with a heavy emphasis on playability and with the goal of offering it as a kit. 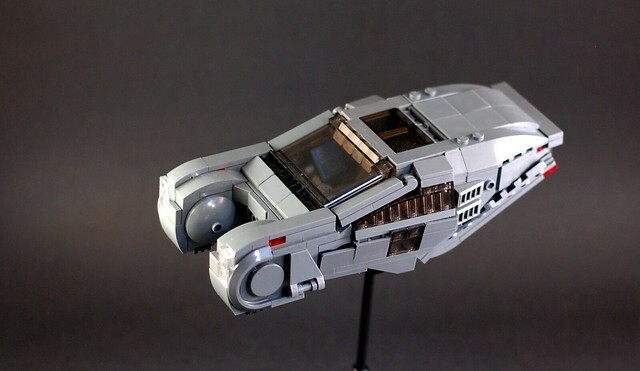 I've partnered with Chris Byrne of Bricks on the Dollar to offer this MOC as a custom kit, with full instructions by yours truly. You can use this link to preorder the model now; it should be ready to ship by Black Friday. Koffy Kat Alpha, -Disty-, and 227 other people added this photo to their favorites. Gorgeous kit! Preordered. Makes me want to design a new gun inspired by K's pistol. Will Chapman awesome, thanks Will! The new blaster would be kickass, it's a helluva hand cannon - though I did appreciate how K spent the second half of the movie wielding Deckards classic piece. Great work on the angles! Will Chapman I've just posted a K's Pistol MOC. Love the spinner design here though! Best one I've seen yet. Nicely shaped, there are lots of these floating around, I like your take on the windshields! the front look amazing ! just like in the movie ! I fell in love with the design after seeing the movie and tried my hand at recreating it....I eventually shelved that project, but I'm glad to see someone did it justice! Wow, the design is so sleek and streamlined! Looks nice! My Spinner cup and pieces arrived in the mail, but there are no instructions. Please help! taylor chase Sorry about that! There's a QR code on the side of the cup that links to the digital instructions, but you're not the first person to be confused by the process. We'll have a more streamlined approach in the future! Brilliant rendition, as soon as I saw it I got all giddy and excited. Great job Carter, and congrats on the collab with Bricks on the Dollar, I hope the partnership continues and you can offer some more of your incredible builds in the future!